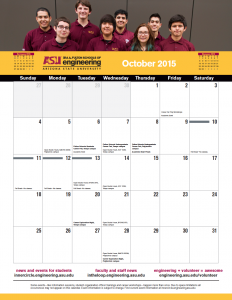 Save and print the October 2015 downloadable calendar. Save and print your Fulton Schools of Engineering calendar for October 2015! This free downloadable and printable calendar will be posted every month and customized with Fulton Schools events. For best results, print on 11″ x 17″ paper with the “Fit” option selected.